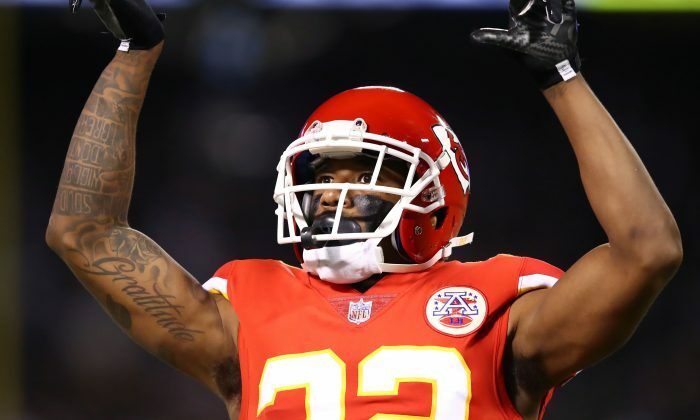 Kansas City Chiefs cornerback Marcus Peters was suspended by his team for one game against the Oakland Raiders for throwing a flag. At the very end of the Chiefs game against the New York Jets on Sunday, Dec. 3, Peters—out of frustration—picked up a referee flag and tossed it into the stands. Coach Andy Reid announced Wednesday that Peters—who is perhaps known best for kneeling during the national anthem—would be suspended for his actions. NFL Network reported that he may have been suspended for leaving the field of play while the game was ongoing. The CBS cameras then showed him walking back onto the sidelines without his socks on. He’ll go without pay for the week, the NFL report said. Peters was upset because teammate Steven Nelson was called for a defensive holding penalty on a two-point conversion attempt. For throwing the flag, he received an unsportsmanlike conduct penalty, but he wasn’t ejected from the game. “I’m not really going to get into the whole thing there, but I did what I thought was best for the Chiefs, and that’s how I try to go about my business,” Reid said on a conference call, reported SBNation.